Sam and David are good friends. They have known each other for a decade. Tomorrow is David’s birthday. Sam has set out to give him a set of FOSJOAS intelligent electric self-balancing scooter long before, but he did not find a good opportunity. Now he snatches this opportunity to buy one set of intelligent self-balancing scooter. 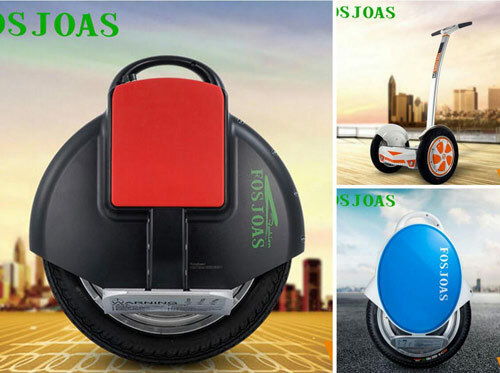 This afternoon, Sam will go to the nearest store for FOSJOAS electric intelligent scooter. He enters a well-decorated FOSJOAS outlet, in which there are many sorts of intelligent self-balancing scooter, e.g. the single-wheeled self-balancing scooter V6, the twin-wheeled intelligent scooter V2 and the two-wheeled self-balancing scooter V9. Greeted by so many electric intelligent scooters, Sam is left at a loss to know which model is the most suitable for David. Considering the fact that David is still a beginner, the FOSJOAS electric scooter V6 is not suitable for him. The FOSJOAS electric scooter V6 is famous for its agility. Nevertheless, it is a bit hard for a beginner to steer it within a short time. Sam is afraid that the formidable hardness will put a dent in David’s confidence to learn to steer. This goes to say that Sam is a considerate friend of David. When Sam sees the exquisite two wheel electric scooter unicycle V9, he narrowly buys it. However, he does not buy it. He finds FOSJOAS V9 is too easy to steer. As long as a rider stands onto it, he can steer it at once. The rider cannot experience the fun and happiness of learning to steer electric intelligent scooter. At last, Sam discovers the twin-wheeled self-balancing scooter V2. It is in transition from the single-wheeled intelligent scooter to the two-wheeled intelligent scooter. It will take few minutes to learn it. Therefore, the rider can experience the fun of riding. At the same time, it is not so hard for a beginner to learn it, which will not let David down. In view of these virtues, Sam buys it without hesitation.